A tiny clay fragment - dating from the 14th century B.C.E. - that was found in excavations outside Jerusalem's Old City walls contains the oldest written document ever found in Jerusalem, say researchers at the Hebrew University of Jerusalem. The find, believed to be part of a tablet from a royal archives, further testifies to the importance of Jerusalem as a major city in the Late Bronze Age, long before its conquest by King David, they say. The clay fragment was uncovered recently during sifting of fill excavated from beneath a 10th century B.C.E. tower dating from the period of King Solomon in the Ophel area, located between the southern wall of the Old City of Jerusalem and the City of David to its south. Details of the discovery appear in the current issue of the Israel Exploration Journal. Excavations in the Ophel have been conducted by Dr. Eilat Mazar of the Hebrew University Institute of Archaeology. Funding for the project has been provided by Daniel Mintz and Meredith Berkman of New York, who also have provided funds for completion of the excavations and opening of the site to the public by the Israel Antiquities Authority, in cooperation with the Israel Nature and Parks Authority and the Company for the Development of East Jerusalem. The sifting work was led by Dr.Gabriel Barkay and Zachi Zweig at the Emek Zurim wet-sieving facility site. The fragment that has been found is 2x2.8 centimeters in size and one centimeter thick. Dated to the 14th century B.C.E., it appears to have been part of a tablet and contains cuneiform symbols in ancient Akkadian (the lingua franca of that era). The words the symbols form are not significant in themselves, but what is significant is that the script is of a very high level, testifying to the fact that it was written by a highly skilled scribe that in all likelihood prepared tablets for the royal household of the time, said Prof. Wayne Horowitz , a scholar of Assyriology at the Hebrew University Institute of Archaeology. Horowitz deciphered the script along with his former graduate student Dr. Takayoshi Oshima, now of the University of Leipzig, Germany. Tablets with diplomatic messages were routinely exchanged between kings in the ancient Near East, Horowitz said, and there is a great likelihood, because of its fine script and the fact it was discovered adjacent to in the acropolis area of the ancient city, that the fragment was part of such a "royal missive." Horowitz has interpreted the symbols on the fragment to include the words "you," "you were," "later," "to do" and "them." The most ancient known written record previously found in Jerusalem was the tablet found in the Shiloah water tunnel in the City of David area during the 8th century B.C.E. reign of King Hezekiah. That tablet, celebrating the completion of the tunnel, is in a museum in Istanbul. This latest find predates the Hezekiah tablet by about 600 years. The fragment found at the Ophel is believed to be contemporary with the some 380 tablets discovered in the 19th century at Amarna in Egypt in the archives of Pharaoh Amenhotep IV (Akhenaten), who lived in the 14th century B.C.E. The archives include tablets sent to Akhenaten by the kings who were subservient to him in Canaan and Syria and include details about the complex relationships between them, covering many facets of governance and society. Among these tablets are six that are addressed from Abdi-Heba, the Canaanite ruler of Jerusalem. 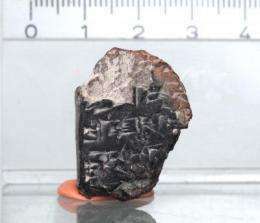 The tablet fragment in Jerusalem is most likely part of a message that would have been sent from the king of Jerusalem, possibly Abdi-Heba, back to Egypt, said Mazar. Examination of the material of the fragment by Prof. Yuval Goren of Tel Aviv University, shows that it is from the soil of the Jerusalem area and not similar to materials from other areas, further testifying to the likelihood that it was part of a tablet from a royal archive in Jerusalem containing copies of tablets sent by the king of Jerusalem to Pharaoh Akhenaten in Egypt. Mazar says this new discovery, providing solid evidence of the importance of Jerusalem during the Late Bronze Age (the second half of the second century B.C.E. ), acts as a counterpoint to some who have used the lack of substantial archeological findings from that period until now to argue that Jerusalem was not a major center during that period. It also lends weight to the importance that accrued to the city in later times, leading up to its conquest by King David in the 10th century B.C.E., she said. Hebrew University archaeologist discovers Jerusalem city wall from tenth century B.C.E. Were Assyrian rulers the forefathers of today's CEOs? Was a 'mistress of the lionesses' a king in ancient Canaan? It was already known that the city was called Zion then. The story states the inhabitants were so secure behind their walls they thought the need only man them with the sick and elderly. When the city fell David commanded all the sick and elderly be put to the sword. A chilling tale. It also teaches one the merits of humility even when one is at the peak of power. Crows do come home to roost. I was simply telling a story about Jerusalem that was Zion. The bible has significant historical and moral merits and it is nothing more than bigotry to deny this. Man wrote it. I am no Christian but I am highly educated and know better than to disparage wisdom from whatever source. Your response was childish and pointless.